Jesus said, "Do not store up for yourselves treasures on earth, where moth and rust consume and where thieves break in and steal; but store up for yourselves treasures in heaven, where neither moth nor rust consumes and where thieves do not break in and steal. For where your treasure is, there your heart will be also." Our starting point this morning is gratitude. Our Psalm for today, Psalm 100, is all about giving thanks to God for the abundance of blessings in our midst. Every Sunday we end worship in a similar way. The worship leader says something like, "Go in peace, serve the Lord" and then we all respond together...."Thanks be to God." Sisters and brothers in faith, we have so many reasons to give thanks. For a multitude of reasons, our hearts are free to sing and sing loudly. I believe it's worth taking some moments to reflect this morning on specific parts of the congregation for which we give thanks! It helps root us in a core of thanksgiving and gratitude - and everything else can spring forth from that core. As I share a few aspects of congregational life I am thankful for, I hope you, too, will be thinking of what YOU give thanks for this day. So many reasons to be genuinely thankful. Today we have a day to think about how we express our thanks to God. To really, concretely imagine how we might give to God out of the abundance that has been given to us. Specifically today, we are invited to think about how we share who we are as human beings, how we share our time, and how we share our money. We're invited to think about the relationship between money and faith and time and gratitude. It's all connected. And as it says in today's Gospel reading, it has to do with our hearts. 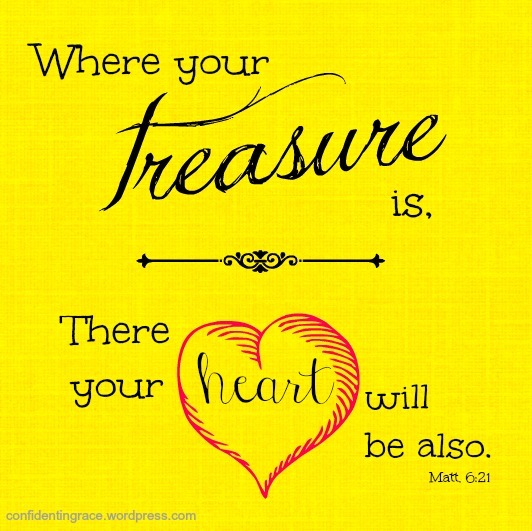 Jesus says, "For where your treasure is, there your heart will be also." He isn't just talking about money. He's saying, wherever you put your time - that's where your heart will be. Wherever you put the majority of your finances/money - that's where your heart will be. Wherever you put your abilities and passions, that's where your heart will be. Jesus does NOT tell us exactly what to do with our time, our abilities, and our money. He just invites us to think about it. To be intentional about it. To see all of these areas as closely related to faith. There are lot of ways to take care of our physical heart organ - now, we get to explore spiritual heart health, too. It's important to say out the outset: conversations about out money, time, and abilities require vulnerability and care - especially in a church. These are important areas of life that we all hold near and dear. It's a special spot for all of us. That doesn't mean we don't need to avoid talking about it; we just need to approach it gently and thoughtfully. Today, in these moments, this is a safe space to think and imagine together. This is a guilt-free zone. This is a stress-free zone. We are all accepted and loved just as we are. Today, we have a space to imagine and think together about how we give to God out the abundance we have received. Today's Gospel words are those of Jesus. He says, don't save up all your stuff here on earth. It's not going to last here. Instead, he invites us to connect our stuff here on earth and our faith. There are a lot of places to put the energy of our heart space. Jesus gives us some guidance. This talk of storing up treasures on earth reminds me of a collection I have. It started in middle school. Stickers and stationary. Tons of it. Notecards. Stickers. Scrapbooking materials (although I do not scrapbook). Neat, right? Except for that I didn't use any of it! I was always saving it for some perfect, future occasion. Some time in my life when I was going to be writing really long letters on awesome paper and then covering them with stickers. That never happened. And now I'm an adult with a giant tote of stickers and stationary. Sometimes we do the same thing with our money, our abilities, and our time - we just save it up and save it up and save it all up. For what? To what end? Jesus invites us to ask ourselves that question today. What are we waiting for? If we are really so full of gratitude and thanks - what are we waiting for? Let's show it! I learned about the joy of regular financial giving from my mom, my grandma, and here, at Zion. Once I became a pastor. I learned from the children of this congregation who graciously give each week. I learned from my colleague and his family's wonderful example. I learned from all of you. It's not like I have lifelong history of generous financial giving. I'm a little later to the game. I represent many in my generation who love church and want to participate - but aren't quite sure how or why to give regularly. I want to share just a little of my own story in the hopes that it encourages you to think about your own story of giving. For those who are already in a regular giving pattern, we give you thanks. And we give the Holy Spirit thanks for leading you in that way. For the first year, I used giving envelopes. Many people love this form of giving which is terrific. I have a pastor friend who finds the process of writing his monthly offering check to be a genuine highlight of the entire month. Beautiful! For me, Sunday mornings are full and I struggled with consistency. I was looking for another giving option. And I found one. Simply Giving. (Many also just choose to have an auto payment withdrawn from their checking account on a regular basis and sent to the church). I remember filling out the automated giving form. I was nervous. I was nervous about what it was going to mean to commit to regular giving that would automatically come out every week. I was thinking of student loan payments from college and graduate school. I wondered how it would all work. Truthfully, the nerves went away after a week of giving. Truly. It's a bonus of the Holy Spirit that giving ends up feeling good. It feels good to support Zion, and our synod, and the larger world. It feels good to support a staff I appreciate and programming that hundreds of people find meaningful. If family obligations and schedules tend to make it difficult to worship on a predictable basis, I encourage you to really consider automated giving. It's really helpful for you and for us as a church. For those who have not yet committed to a weekly/monthly giving pattern, my encouragement to you today is to consider it. Pray about it. The dollar amount is not as important as the commitment. It's an opportunity to express gratitude to God in a concrete way. It's also really important to mention another piece of the gratitude/giving puzzle. Life has different seasons. Every season is equally important. Sometimes we are in a season of life when the best way we can share thankfulness to God is with our time. There are other seasons in life when the best way we can express our thankfulness to God is through our finances. There are season when the best way to share our thankfulness to God is by carving out a way to share a unique ability, passion, or interest. And thanks be to God, there are some seasons in life when we can do a little bit of each. Whatever season you are in, you're loved and accepted and integral to this family of faith. Jesus talks about heart health in our gospel. Your heart is so important to us. There is only one YOU. No one else has your same heart. And we are so genuinely thankful for your presence in this place. Friends, I'm excited. WE are excited as your pastors....For who we are as a church....For who God is forming us to be moving forward. Let's root ourselves in gratitude and joy. Don't make the mistake I made with the stickers and stationary, saving it all up for some unknown occasion. Instead, share who you are. Together, let's imagine the beautiful future God has in store for us! May God guide all our hearts as we follow where the Spirit leads. Amen.